MISSION VIEJO -- The Trabuco Hills Invitational kicks off on Friday, highlighted by the Invitational heats for the distance events. 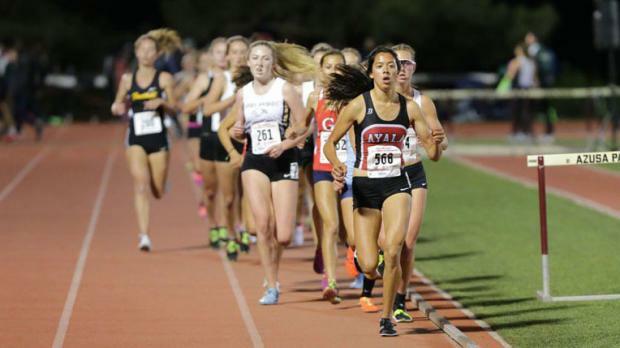 Headlining the Girls Invite 800 meters, Ayala's Mikaela Ramirez is the heavy favorite. Rebounding off national caliber performances last weekend, she kicked off her 2019 season last month on the same track with an impressive 2:14.59 victory. She is the only girl ranked in the Top 10 for the Southern Section in all three distances while she is top-ranked in California for the 3200 meters (10:19.42). Ramirez will take the pace out around 65 seconds and set the pace for anybody willing to challenge! Redondo's Dominica Villegas comes in off a 2:16.50 effort last weekend. Meanwhile, Santa Margarita's Kendall Saeger, a 2018 SS Div. 3 finalist, crossed in 2:19.44 to open her season last month. The duo from Mission Viejo in Grace Fulwiler and Caitlin Ree, along with Santa Margarita's McKenna Bradley will use the brisk opening lap pace to break 2:20 for their first time while Etiwanda's Laila Wright looks to improve her 2:19.11 best from the 2018 season. Another Bulldog from Ayala, Andrew Martinez is the favorite. He impressed with a 4:15.70 victory last weekend, which is currently the seventh best effort in California. Martinez steps on the line with a 1:55.54 best from 2018. Camarillo's Seth Meline rolled to a new personal best of 1:55.87 last weekend. Meanwhile, coming in from Los Angeles City Section, Dorsey's Christian Rodriguez opened his season with a 1:56.14 last month. Finally, La Mirada's Christian Santiago looks to improve his 1:57.35 best from last season. Many of the top names are also slated to compete in the 1600 meters as well. After coming off a great cross country season, Sage Creek freshman Stormy Wallace ran to an 11:17.72 best two weeks ago at Laguna Beach. Santa Ana's Maria Hernandez owns a best of 11:02.75. Paramount's Alejandra Ayala raced to a 11:14.93 personal best two weeks ago while Warren's Nadine Gomez (11:02.39 best from 2018) will also look to keep pace with the front pack. The headliner here is Mission Hills' Jonathan Velasco. His 9:07.27 effort at Laguna Beach two weeks ago is top-ranked for the San Diego Section. Velasco burst onto the national scene with his 20th place finish at the Footlocker Nationals last December! Meanwhile, the rest of the field is looking to break 9:30. Redlands' East Valley's Matthew Casillas ran to a best of 9:28.16 last year. Brea Olinda junior, Shane Gaffikin is coming off a 9:33.23 performance in a dual meet this week. El Toro's Mitch Groff is off to a slow start in 2019, but expect to challenge his 9:30.95 personal best from his 2018 sophomore season. Do not overlook Santa Ana's Diego Duran as he raced to a 9:34.91 effort two weeks ago. Capo Valley's Carly Corsinita (left in yellow) comes in after setting a personal best in the 3200 (10:38.31) last weekend and looks to set another personal best as she toes the line with a 5:09.91. But Redondo's Isabella Landry is coming back from 5:04.57 personal best last weekend and will push the pace. Upland freshman Riley Rodriguez continues her rise into the California spotlight as she is coming in after qualifying for the California State Championships this past cross country season. Two weeks ago, Santa Ana's Maria Hernandez crossed the line with a new personal best of 5:10.34. El Toro's Alexis Neuville (5:15.00 best) and University City's Isabella Shepherd (5:10.23 best from 2018) are also top headliners slated to compete. Concluding the Friday night session, the Boys Invite 1600 meters became rather intriguing over the past week. In regard to the favorites, the nod goes to Crawford's Nader Ali. Coming up from the San Diego Section, Ali's 4:17.82 breakthrough performance was a 10-second improvement from last year! Ali was a State Meet qualifier in the 800 meters with a 1:55.28 best but will look to improve upon last weekend. It will be a rematch as he will have to battle Jonathan Velasco of Mission Hills once again. Velasco crossed right behind Ali (4:17.91) and is currently fourth in California (9:07.27) for the 3200 meters. Trabuco Hills' Josh O'Neill will defend his home turf. He rolled to a new best of 4:19.00 in a dual meet last week. Finally, Upland's Jeremiah Castellano comes in with a 4:19.84 best from his sophomore season a year ago. Sage Creek's Daniel Rubin and Redlands East Valley's Simon Opsahl will also look to break 4:20 under the lights on Friday night!